Readers and now official set soldiesr, Yukkei & Leora, was lucky enough to meet some heavy hitters on the Cosmopolis set today. My friend and I waited almost 5 hours but it paid off! Caitlin was very nice and she gave us bottles of water because it was so hot outside. David was also very nice and took pictures with us. Rob was going in and out of his trailer to set but after they wrapped shooting, there were only about 6 of us and Rob agreed to come out and sign autographs but no pictures. He was very sweet and so beautiful in real life! Both Rob and David said filming was going really well… day 4 of a 40 day shoot. Thanks for sharing Yukkei & Leora! What an incredible weekend for Cosmopolis! Great way to kick off shooting. In the words of Marina, WAYmazing! This has been GREAT for the film. Free promotion and buzz. I’m into it. I love all these pics & that he was able to make time for his fans today too…he seems like a wonderful guy! SQUEEEEEE! Oh D. Cronenberg! That was really nice of him! 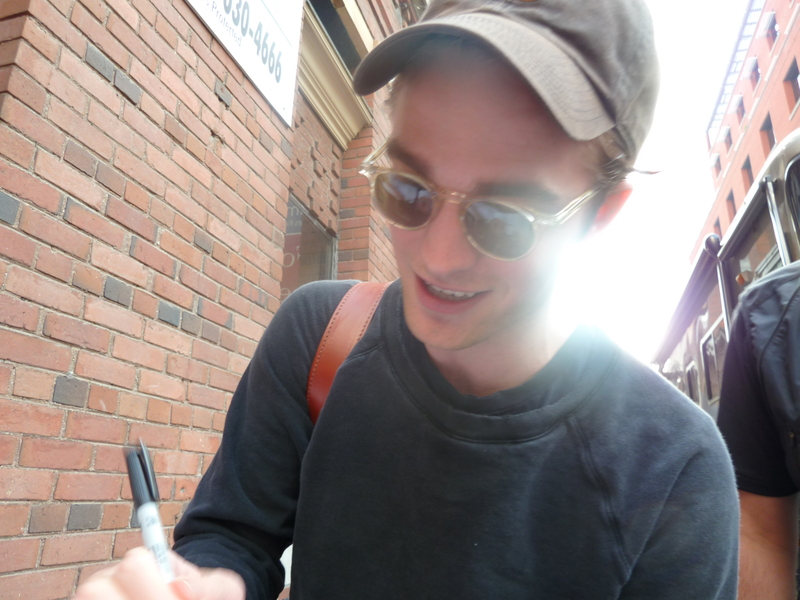 It could have been Rob’s people saying no pictures with him or him saying I only have time to sign. It’s clear cameras and cell phones are out and not hidden in the photos so we don’t know what was actually said. The girls that submitted this are very kind and Deb met them as well. Please don’t assume they were disrespectful. Now he looks like Rob again! It always amazes me how he changes so easily into the character. It’s like he “becomes” him..and all it took was a different hairstyle and a sharp suit. 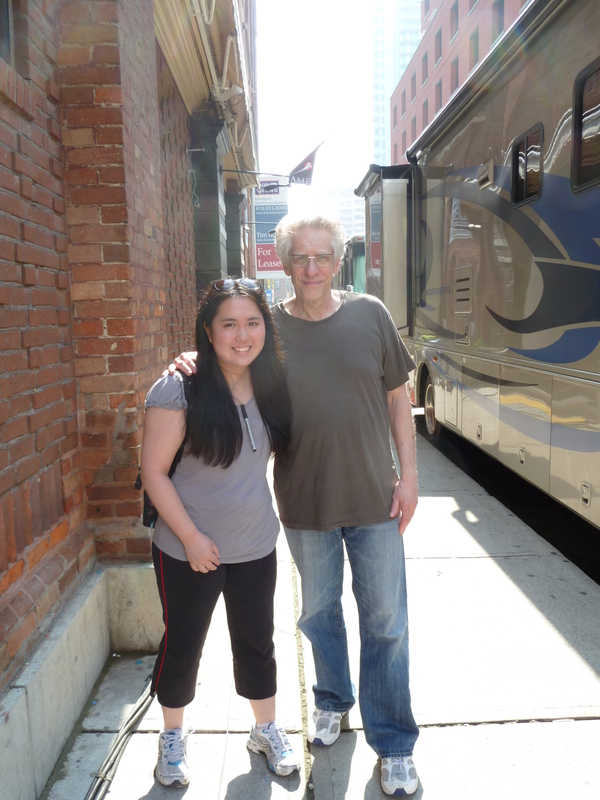 He is so good with his fans that he finds time for them at the end of a hard day and lots of hugs for Mr Cronenberg…he is a sweetie! Day 4 of 40, tic toc. Looks like fun up there! with Deb, is that here somewhere? This is all so exciting! What luck to have you girls everywhere that he is to share this all with us! Between WFE and this it’s turning out to be a very good Rob year!!!! I wonder what’s next?